Asparagus seems like a pain to cook, and there’s even a special pot available to cook it, but here is a way to cook it fast and easy, and the asparagus comes out delicious every time. If the spears are thin as a pencil, there’s no reason to peel them. 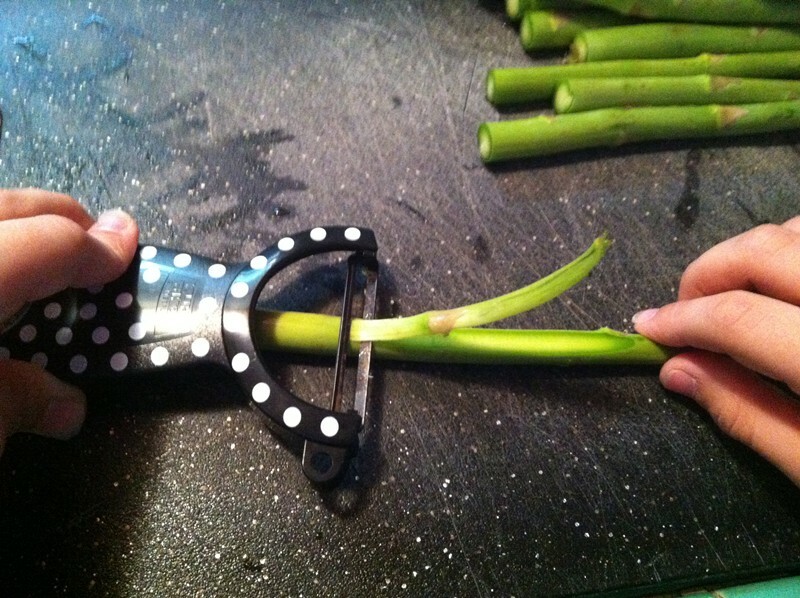 Any spears thicker than that, an OXO, or better yet a Kuhn Rikon peeler will do a great job. Just lay each spear down, take a strip of peel from below the tip of the spear to the bottom of the stalk. Rotate the spear ¼ turn, peel it again, and repeat 2 more times. You don’t have to get all of the peel off, just 4 sides. Next, cut off the bottoms of the stalks, so that the spears fit in your sauté pan. 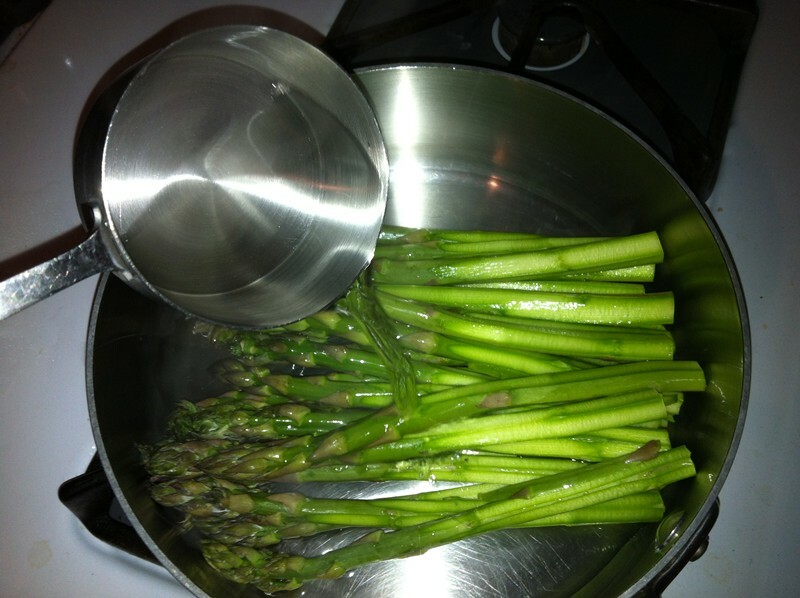 Next, boil ½ cup of water, lay the asparagus spears in a saute pan, 1 or 2 layers deep, and pour in the boiling water. Put the lid on tightly, and turn the heat to high. 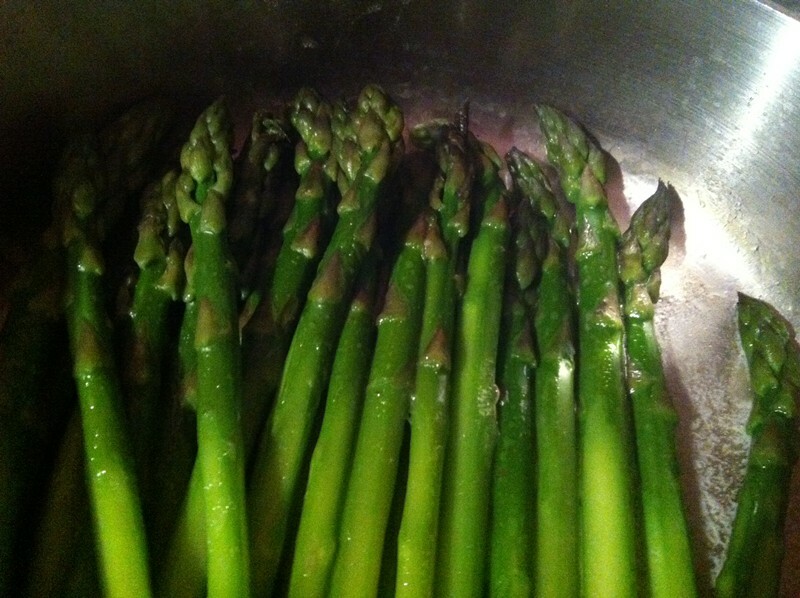 Cook the asparagus for 4 minutes and 30 seconds (4:30), with the lid on tight for steaming. Turn off the heat, and drain any remaining water. Return the heat to medium, and add 1 Tablespoon of butter. As it melts, roll the asparagus spears back and forth until the butter coats them. If the asparagus begins to brown, that’s okay, it tastes great. Remove the asparagus spears and put them on a serving plate. Salt and black pepper them. A little chopped parsley on top is optional. A few shaves of parmesan cheese is good, and wrapping them spears in proscuitto is a classic way to serve them..
Sauteing them in toasted sesame oil sounds good, but it is not. 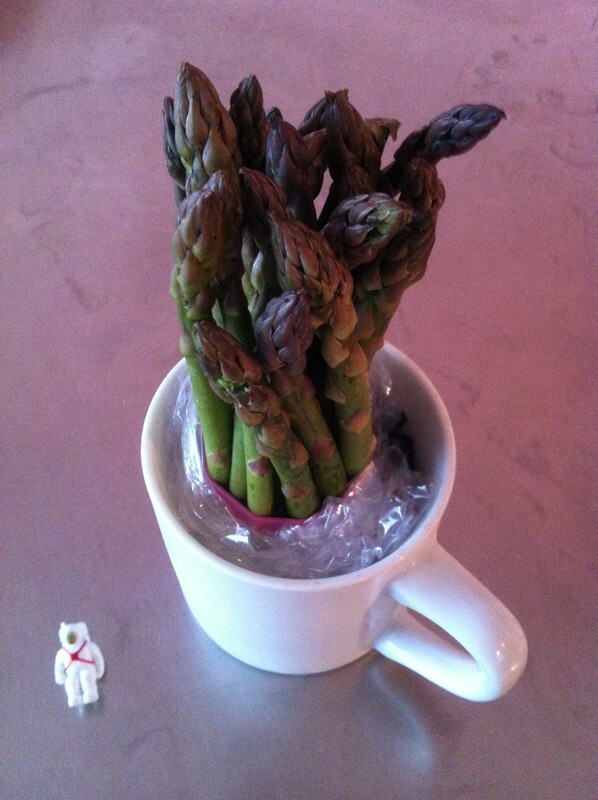 If you store asparagus in a plastic bag, the tips will soon begin to rot. Instead, take the entire bunch and slice off an inch from the bottom of the stalks with one cut of a chef’s knife. Then I pour an inch of water into a large coffee cup, tall jar, or plastic container (We use large soup containers from Chinese food carry-out) and put the spears in it. Tuck the plastic bag from the store into the cup to keep the water from evaporating. The asparagus tips will stay dry, and the veggie will easily keeps for a week.